Situated in Mellingen, this hotel is 2.5 mi (4 km) from Belvedere Castle and within 6 mi (10 km) of Römisches Haus and Parkhohle. Goethe House and Goethe National Museum are also within 6 mi (10 km). Mellingen/Thür Station is 25 minutes by foot. 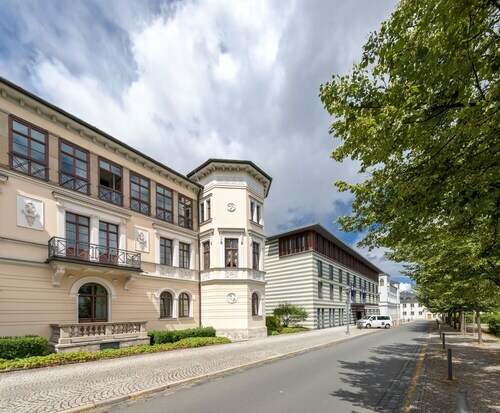 This hotel is located near historic downtown Erfurt, Erfurt Cathedral, and Egapark Erfurt. Erfurt train station is just a 10-minute walk away. Located in the heart of Erfurt, this luxury hotel is within a 15-minute walk of St. Severi Church and Kramerbrucke. Erfurt Exhibition Centre is 1.8 mi (2.9 km) away. Erfurt Central Station is 22 minutes by foot. How Much is a Hotel Room in Mellingen? 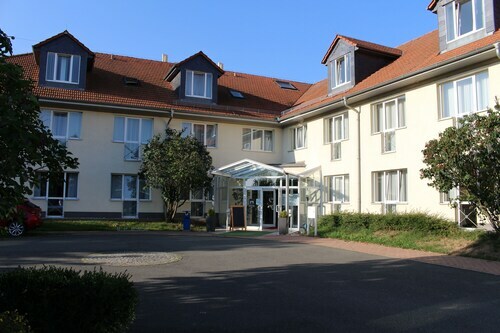 Hotels in Mellingen start at $95 per night. Prices and availability subject to change. Additional terms may apply. Travelers in Thuringia who are dreaming about somewhere to stay close to Mellingen have plenty of accommodations choices. Those using Travelocity presently can access 17 excellent accommodations within a 6-mile (10-kilometer) radius of Mellingen's main area. An ideal option for the times you need to wake up nice and close to downtown Mellingen, is the Ilmtal. 5 miles (8 kilometers) outside of the middle of Mellingen, you will come across the Lindner Spa & Golf Hotel Weimarer Land. 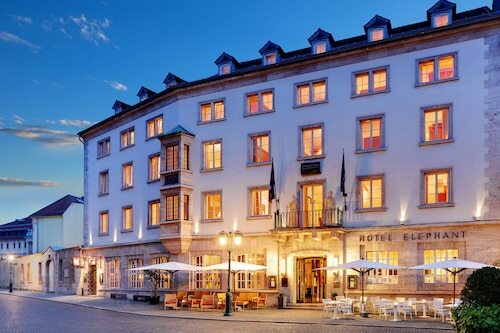 The Hotel Elephant, a Luxury Collection Hotel, Weimar is about 4 miles (6 kilometers) away. The Dorint Am Goethepark Weimar and the Hotel an der Therme Haus 2 are other alternative options in Mellingen. 50 miles (77 kilometers) away from Mellingen, you will reach Eisenach, home to Wartburg Castle and Karlsplatz. If you want to spend any time in Eisenach, be sure to check out the Romantik Hotel Auf Der Wartburg and pentahotel Eisenach. Or, you could consider staying in Erfurt, 17 miles (27 kilometers) to the west of Mellingen, where you can choose between the Radisson Blu Hotel, Erfurt and Dorint Hotel am Dom Erfurt. If you're staying in Erfurt, make sure you explore the Erfurt Cathedral and Egapark Erfurt. Make sure you get a serving of sport by making a trek to Red Bull Arena, situated 50 miles (81 kilometers) to the northeast of Mellingen. Travelocity readers who enjoy the idea of locating a room nearby, book a room in the Steigenberger Grandhotel Handelshof Leipzig or Radisson Blu Hotel, Leipzig. Erfurt Airport is a convenient arrival point for air travel, and is found 19 miles (31 kilometers) from Mellingen's center. Travelocity-listed hotels located close to Erfurt Airport are Airport Hotel Erfurt and Hotel & Restaurant Park-Cafe ISA.